If you know little or nothing about Occultism and have been led to believe Occult Books consist of works on black magic and witchcraft the books reviewed on this page may well change your mind—and your life! If you would like to know more about the Sublime Occult Mysteries and occult sciences we teach before applying for membership, you may find the following five books of interest. 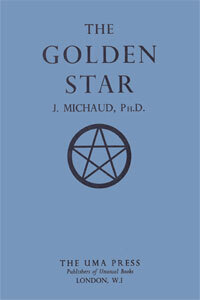 They were all written by J Michaud PhD, an advanced member of this Mystery School during the last century, as you can read in The Golden Star, the second of the occult books he wrote during his lifetime, most of which are now almost entirely unknown. They were published by the UMA Press in London between 1939 and 1950, and it is now very difficult to obtain any printed copies of them. For this reason they have been re-published in electronic format, free for all to read and study online in their own time and at their own pace with no obligation to apply for membership of this Mystery School. 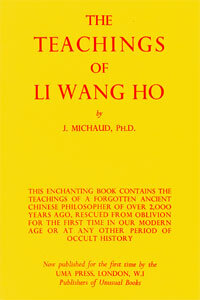 Each of these remarkable books reveals several of the true laws and principles of occult science. Much of this information has never been made available to the public before. Even if you choose not to apply for membership these books can be of enormous personal benefit to you if you study them with an open mind and your full attention. You can read more about the author and his books on the website of occult-mysteries.org. In answer to the many requests occult-mysteries receive for printed copies, we regret that they have no plans to produce printed or PDF editions of these books at this time. Nothing quite like this most unusual book, subtitled a 'Diablerie in Four Movements or a Symphony in Words', exists in the annals of occult and mystical literature. Nor do we know of any books in which the sincere seeker after Truth may find the answers to the great mysteries of life and death explained with such simplicity and clarity. 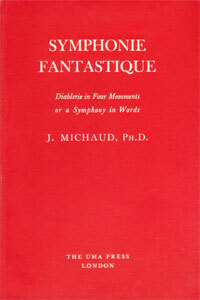 Although the author was an accomplished musician and the narrative closely follows the structure of a classical symphony of four movements, Symphonie Fantastique is not a book about music, but Spiritual Enlightenment and Liberation. The story is set some 427,000 years in the FUTURE, at the close of the Kali Yuga or 'Black Age', and describes the final battle between the Powers of Light and the forces of darkness which will usher in the 'Golden Age' longed for by so many mystics. This book is about the life of Krishna—the Holy Hindu Saviour and prototype of Christ. It was first published by the UMA Press in London in 1950 and is now almost unobtainable in print. It is now available to all readers for the very first time on the Internet. The book describes many of the incidents found in the New Testament but enacted 3,000 years previously wherein John becomes Arjuna, Maia the holy Mary, and Christ Krishna. This book depicts a living picture of the India of 2,000 years ago; drawn with unerring skill and poetic power by the inspired hand of Dr Michaud. The reader will discover a glittering panorama of gorgeous scenery: of a tremendous 'black' ceremony by an evil wizard; of extraordinary 'Tests', and Initiations into the Arcane Mysteries; of strange adventures; exotic love scenes; of a great Rishi; and of a Master who surely represents the ideal of every Seeker; and—above all—of true elucidations of some of the hidden secrets of the Universe, so far as they may be disclosed. This remarkable book expounds the teachings of a forgotten Chinese Sage of over 2,000 years ago, lovingly restored once more for the benefit of all sincere seekers after Truth and Wisdom. A Muzchik, in his review for Occult Mysteries, writes: "This is one of those very rare books in any age that can change your life for the better. You do not need to be an occultist or mystic to benefit from the teachings it contains. You do not even need to know much about philosophy or ancient Chinese literature. All you need are an open mind and a thirst for Truth." We agree. This fast-paced story abounds with enchanting descriptions of the China of 2,000 years ago and its colourful folklore and customs. We are introduced to many memorable characters, including the inimitable Lu-shun, who typifies all the very worst characteristics of so many seekers after occult 'powers'. Yet, in the end, he is redeemed through the wonderful teachings of the Sage, Li Wang Ho, whose many wise sayings and observations upon material and spiritual life will appeal to every kind of reader. 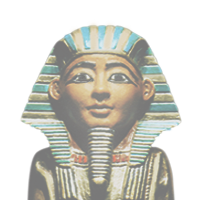 The Mystery Teachings were once taught in the great Mystery Schools of ancient Egypt which flourished for many centuries. But there was a later Egypt, when the Wisdom they taught became lost, and in place of it there appeared the many "magical" papyri of the 3rd to 5th centuries A.D. Many scholars and seekers believe that these constitute the real and true Wisdom of Egypt, but this is wrong. They are the distorted and fantastic remnants only, and little else. 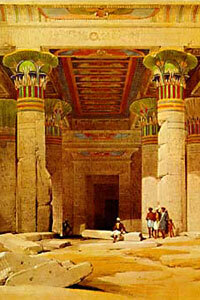 By the time the Greeks invaded Egypt, there was almost nothing left of the real Occult Mystery Teachings. Thus we arrive at the modern age, when a multitude of "masters of the mysterious", "channelers", psychics and self-styled "adepts", blind as blackberries, hold forth on what they do not understand, being believed and aped by their misled followers. The unwise leading the stupid, the lame leading the limbless, the deaf not hearing Truth, for it remains unrevealed, like the mole in his tunnel where the sun does not penetrate and darkness is the god of Light. Some mystery schools pride themselves on the 'modernity' of their teachings, forgetting or never knowing that there can never be such things as 'up-to-date' truths, for how can the eternal verities ever change? Other schools and occult orders immediately plunge their members into all manner of complicated rituals and occult exercises—without explaining the mechanism behind such work—generally because the leaders of such schools and orders do not know themselves. Such exercises are quite useless unless the student has first learned to master their turbulent emotions and acquire a measure of self-control. If you know anyone who is a member of such occult groups or schools you will know we speak the truth; if you do not, you may take our word for it that not one in a thousand of the self-styled 'adepts' and 'magicians' who belong to such organisations are in possession of that inner calm and self-mastery which is the first and hardest attainment of the true seeker after the One Light of Truth. 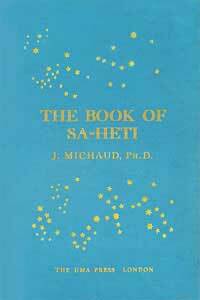 In addition to the books listed on this page, Dr Michaud wrote a few short stories during his lifetime. So far as we are aware only two were ever published. These were The Rhododendrons and The Bronze Mirror, both of which can be read at occult-mysteries.org. Occult-mysteries.org have also published a short story which appears in Dr Michaud's first book, Occult Enigmas—Meditation; or the Way of Escape—which conceals several important occult truths in a seemingly daft manner. 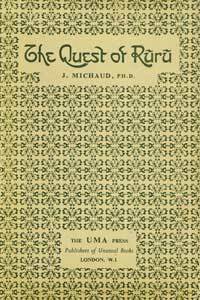 Finally, the same website have also published a personal appreciation of Dr Michaud's occult books by a reviewer which is well worth reading for the additional insight and background it provides into the five books we have listed here.